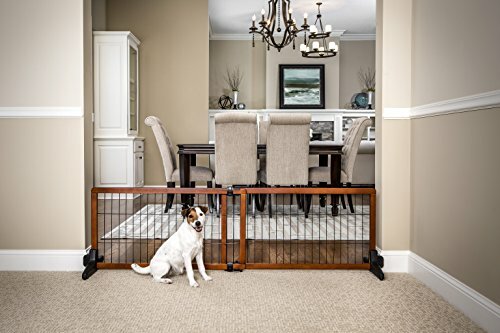 Dog gates have been used for many decades to keep them in specific parts of the house so they do not destroy expensive furniture, carpeting and other valuables. There is a huge selection of dog gates on the market today. Deciding you need a dog gate is the first step but it doesn’t stop there. After extensive research, comparing the most popular dog gates available against each other, we narrowed the search down to the three top rated dog gates that are customer favorites and that provide the dog owner with a strong, attractive dog gate that will help them keep their dog contained to one area. Many people use them to keep children and pets in separate areas as well. When you choose a dog gate, you need to have as much information as possible so you make a choice that will not result in disappointment. With the large selection of dog gates available, it is easy to get overwhelmed and just decide to guess. We are here to make the process much less overwhelming and will give you the details on three terrific dog gates that get the job done. In addition to the reviews we have included a buyer’s guide with even more pointers and information. After reading these reviews and the guide, you will know what you need to know to make an excellent choice that you will be very pleased with. 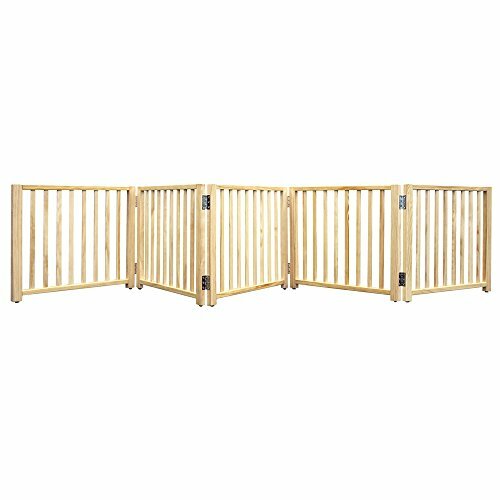 Dog gates have come a long way since they were unattractive wooden devices that looked like accordions. Primetime Petz provides dog owners with this beautiful, stylish gate that is as functional as it is attractive. Users will be able to use this useful gate in openings that are as large as 80” wide. The convenient walkthrough door opens both inwards and outwards, to enable the owner to pass through simply and easily. The special hinges the gate is fitted with allow the panels to rotate a full 360 degrees so users have access to limitless gate configurations that can fit any number of situations. The rubber pads at the bottom of the gate prevent it from slipping, and also protect your wood and tile floors from scratches. The gate folds down quickly for easy storage and travel and is very lightweight so moving it from place to place is not cumbersome. The Primetime Petz Gate with door has 4 wide panels that allow users to span narrow and wide openings with the same ease. It is furniture quality and will not detract from the room’s décor or style. The gorgeous walnut color is perfect for any home that doesn’t want to give up style for function. This gate can even be made into a pen if needed. The distance between the spindles is 1.75” so the dog can’t get their head lodged in between them. The door locks securely into place with a spring-loaded function that will prevent the dog from being able to paw it open. It is a perfect gate for your barricading issues. If larger spaces are needed, there is an extension kit available for purchase that will connect to the existing gate. Four Paws provides dog owners with a gate that is stylish, functional and easy to use. There are no tools needed or assembly required to get this gate up and ready to use. The natural wood design goes well with any décor. The Four Paws Folding Panel Gate sets up in just seconds. Taking it down is very easy so storing is simple and convenient. This gate is easy to travel with as well because it folds flat. Just slide it into the trunk and you can stack suitcases and other travel gear right on top of it. This gate will work to barricade openings from 48” to 110”. The 5-panel gate is 17” high making it great for puppies and smaller breeds however large dogs may be able to get over it fairly easily. You can use this gate as a freestanding pen or to block specific openings. If you need a taller gate Four Paws offers this gate in multiple sizes and number of panels to fit every dog owner’s needs. Cleaning is easy; just wipe down with a soft, dry cloth. If needed, each panel can be separated from the others if you need a shorter section. If you are looking for a temporary solution to blocking a doorway or space, the Carlson Adjustable Extra Wide Freestanding Dog Gate will do the trick. This freestanding gate will expand all the way to 70” wide and will fit openings as small as 40” wide as well. It is 20 inches tall so it may not b e the best choice for a dog that is exceptionally tall or that loves to jump. The attractive cherry finish goes with many different styles of décor. It will look good in any doorway you choose to use it in. Set up is super simple and moving it from place to place is equally convenient and easy to do. 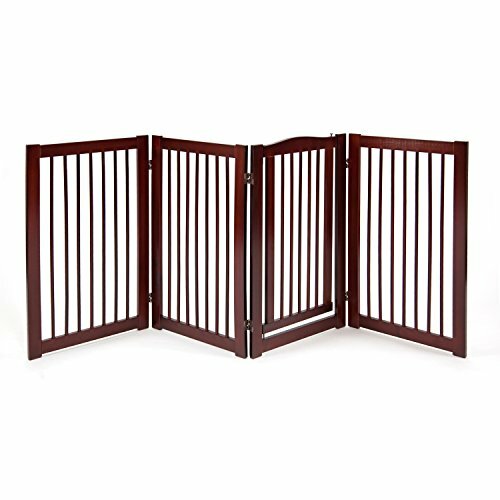 It is the perfect gate for the extra small toy breeds to small breeds and puppies as well. The construction of this freestanding dog gate is hardwood with black accents so you do not have to give up style for function. The slide and wide latch system is very easy to operate. Another popular use for this is in commercial dog establishments when separation is needed for one reason or another. If you prefer pressure mounting rather than freestanding, this gate can accommodate and be installed as a pressure mounted gate as well. Users will receive a 90 day limited warranty as well. There are many times when a dog owner needs to separate their dog from other dogs or from the rest of the family for one reason or another. All three of the gates we have featured are at the top of the list for functionality, style, ease of use and portability. No dog owner wants to have to fight with a dog gate. With any of these dog gates, struggling to set them up or use them is a thing of the past. There are no worries about having to put up with unattractive gates anymore. All of these top rated dog gates are made from attractive hard wood in a range of colors that will look great in any doorway rather than ruining the look of the room. Below is our buyer’s guide that has even more information on choosing the right dog gate for your needs. Dog owners can learn what to look for when they are searching for just the right gate for their dog and their home as well. What is a Dog Gate? A dog gate is a piece of furniture that is used to barricade openings of all kinds, including doorways, stairways, porches and much more. They are typically made from hardwood, metal or hard plastic and have been used for decades for the purpose of keeping dogs of all ages where the dog owner wants them to stay. They are often used for babies and puppies as well. It is the perfect solution for keeping your dog safe in a way that doesn’t have to take away from the look of your home. The gates that are being made today are much stronger than their previous counterparts used to be. They are made from strong materials that are scratch resistant and that fit the décor of a room rather than just barricading a door. If dogs are left alone for a length of time, they can very easily get into trouble and destroy some really valuable property. Using a dog gate protects your valuables as well as the dog and gives the owner peace of mind whenever they have to leave their dog alone. One of the most important things to make sure of when choosing a dog gate is that it is tall enough that your dog can’t jump over it or climb over it. A gate does no good if the dog can just waltz right over it. There are gates of all heights and sizes available. We will provide you with information on how to choose the gate that will work for your home, your dog and your specific needs. There are several factors you need to consider when shopping for a dog gate. One of the most important factors is where you will be using the gate. Frequently, dog gates are used at the top of stairs or between rooms to keep the dog either in or out. Certain gates are better for certain areas. A freestanding gate should never be used at the top of a staircase. The dog or a child could lean against it and topple down the stairs with the gate. If you are using the gate at the top of a staircase, be certain to get a gate that is screwed into the wall or doorframe and not a pressure mounted or free-standing model. Look at the doorframes and architectural design of your doorways or openings so you can purchase a gate that can accommodate those style designs. This can be a little tricky at the top of a stairway, so you will need to find two places to securely attach the gate. Many dog gates come with optional hardware if you want to mount it in a doorway. Make certain that you install it properly and securely so if the dog jumps up against it, it can’t fall over. Open concept homes are very popular with people nowadays with doorways and openings being much wider than they used to be. Sometimes a home may have a super large archway between rooms rather than a specific doorframe. The gates that are being made by manufacturers now have begun to accommodate the “open concept” design and they can expand to huge widths. If the gate doesn’t fit the space right off the bat, many designs allow for the addition of extra panels that can be purchased separately. When used properly, a freestanding gate with folding sections may be a great choice for these super wide openings. As long as the gate is tall enough and the dog can’t paw the gate away from the edge of the wall, you should be able to use the freestanding designs. In many cases dog owners will want to keep their dogs in one room or keep them out of a room such as where a baby is playing or out of the kitchen. It is easy to find a dog gate that will accommodate most regular doorways. You can choose to have a free standing gate, a pressure mounted model or a mounted one. One thing to consider about mounting the dog gate is that it will mar the doorframe, but it doesn’t have to be significant damage if you are precise in where you want the gate and take your time installing it. There are many other features that a dog gate can have. These features can make using a gate even more convenient. How wide is the Space between the Spindles? – You want to be sure that the space that is between each spindle is not too large. If the dog csn get their leg or head through and stuck, it could cause them to sustain an injury. The usual spacing is about 1 ¾” which is a good distance. Any more than that and problems could ensue. Auto Close/Lock Doors – One really convenient feature that dog gates can have is a door within the gate that opens and shuts. This prevents the dog owner from having to step over which could be precarious with an armful of groceries or while holding a child. This feature is more prevalent with metal dog gates, but at least one of the wooden choices above has that feature with a gate that swings both directions and locks automatically. Folding Panels – A dog gate that has folding panels can be a real convenience especially when the openings you are blocking are wider than a traditional doorway. The folding design of the dog gate makes it very easy to collapse and store away or put in the truck to travel with. It also makes it easy to make a completely enclosed pen. Step Over Gates – Some of the dog gate designs are meant to be simply stepped over rather than walked through. These step-over gates are not usually good choices for people that have dogs that are larger in stature. If you are blocking puppies or toy and other small breeds, a step over gate will work just fine. Easy or No Assembly Required – The easier a dog gate is to use, the more often the dog owner will use it. If they have to struggle with the gate falling over or opening it is not easy, they will look for other options. This is why it is important to choose the right gate for your specific needs. If you want a gate that has a door, look for those models and pass over the step-over varieties. Heights and Sizes – There are many different heights that dog gates are made to accommodate the different needs a dog owner has. If you need a gate that is higher than the standard, look for tall gates that will be good for larger dogs or dogs that are prone to jump. Make sure you know the height of your dog so you can choose a gate that will work well to keep them contained. Wooden dog gates are usually made of hardwood of some kind and can be natural wood color with no finish or an array of other colors such as cherry, walnut and pine. It isn’t difficult to find a finish that works well with the décor of your home so the gate looks like an extension of your home and doesn’t stick out like a sore thumb. If style and looks are important to you, choose either the metal or wood varieties which have many different color and style choices available. You will be able to choose something that is functional but also attractive to look at. Keep in mind that if your dog is notorious for chewing, a wood finish gate could get ruined if they decide to chew threw it. Dogs can be very destructive if they want to get somewhere bad enough, so you will need to account for this in the type of gate that you choose. You don’t want to spend money on a beautiful cherry finish gate only to come home and find that your dog has chewed through several of the spindles and ruined it. Metal gates will be the best choice for chewers as they cannot chew through the metal. There are many different reasons a dog owner may choose to get a dog gate. They may want to keep their dogs and kids separate, they may want to keep the dog out of a family gathering or away from the kitchen while people are cooking or they may need to corral a little of puppies so they don’t ruin the carpeting or flooring. Whatever the reason is, there are multiple choices that a dog owner has to get the job done. The information in this guide and the reviews of the top three dog gate choices above will help dog owners find the type and kind of gate that will be the best for their needs. The right information gives consumers the ability to make informed decisions that will fit their needs and enable them to accomplish their objective.